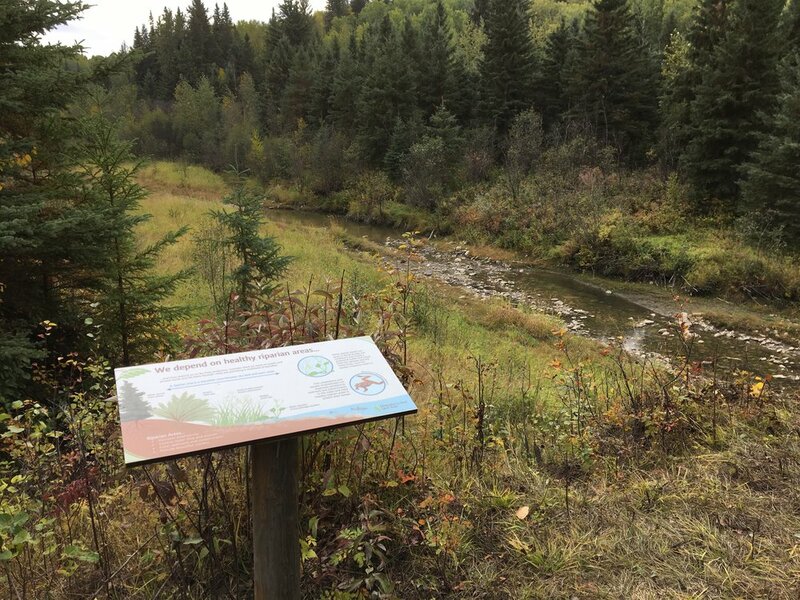 LEDUC COUNTY AND EDMONTON, AB | September 28, 2018 – The Edmonton and Area Land Trust (EALT) is delighted to announce the culmination of its year of work designing and creating safe and scenic foot trails through the native woodlands of Willow Creek, installing entrancing interpretive signage throughout, and remediating the trails gouged out by illegal Off-Highway Vehicle (OHV) use. One of the many conservation lands that EALT manages is called the Coates Conservation Lands. This 80 acre parcel is northwest of Calmar in Leduc County, at the intersection of Township Road 502A and Range Road 280, and is only a 55 km drive from central Edmonton. The land straddles Willow Creek, which is an important tributary of the North Saskatchewan River, only 2 km downstream. By connecting to the North Saskatchewan River and its river valley, Willow Creek acts as an important travel corridor for wildlife, as well as supporting crayfish and mussels. It is located in an Environmentally Significant Area of Regional Importance and High Sensitivity, and is designated an Environmental Reserve Easement by Leduc County. The creek has also been the scene of significant dinosaur-related finds, a number of which now reside in the Royal Tyrrell Museum. The lands are virtually all old growth forest – mainly aspen parkland, with a pocket of coniferous forest. So they support a variety of species, including moose, deer, coyote, fox, porcupine, black bear, and beaver, and are the type of habitat favoured by species at risk, such as barred owls. Thus the Coates Conservation Lands protect an essential piece of the North Saskatchewan watershed, and an important wildlife corridor. These special lands were bequested to EALT by Ethel Coates, a nature and wildlife-loving individual who was concerned about abuse of the land by OHV riders, and she also wanted people to enjoy and care about what nature has to offer. When EALT secured the lands, they discovered rampant OHV use down the steep slopes, along the riparian areas, and criss-crossing the creek at numerous places. All of this was illegal, and created massive gouges and erosion of the land, and siltation and pollution of the creek and fish spawning areas. Therefore they developed a plan to remediate the damage, block OHV access, and to create a new foot-trail via a safer route. At the same time, a variety of illustrated interpretive signs were developed to enhance public understanding of the land’s many values. All this was completed through the effort of dozens of EALT volunteers. All of this work has been done to improve visitor experience and understanding of conservation values at Coates. Having a brand new trail, new interpretive signs and newly hidden geocaches allows visitors to enjoy the natural beauty and learn about the land all the more. This includes everything from the present - including many songbirds, freshwater mussels and beaver, to the past - including dinosaur footprints. EALT has always been close to the family of Ethel Coates. They decided to honour Ethel’s donation in one of the Trail Head signs, and celebrated her donation as well as the completion of the public foot trails at a special ceremony last week. The Mayor of Leduc County, Tanni Doblanko, officially opened the conservation lands and foot trails to the public, and spoke about the fabulous creek views and the terrific resource that EALT has made available to citizens. She marked this celebration by signing and installing a nest box at the trail head. Besides the public, attendees included the North Saskatchewan Watershed Alliance who supported EALT in their work, as well as many of Ethel Coates’ family, young and old. Family members found the entire event very meaningful, and were truly touched by EALT stewardship of the lands, which reflected the very spirit of care that Ethel would have wished. Three generations of Ethel’s family attended, including several younger ones, and everyone tackled the trails and steps during the interpretive nature walk with relish. “We want EALT to know the whole vision out there has really surpassed anything we had imagined ...it is so perfect and Aunt Ethel would have loved it as I hope others do in the future”. Cheryl Bissell and Beverly Tilson, nieces of Ethel Coates. The Edmonton and Area Land Trust (EALT) is a not-profit organization whose goal is to preserve the natural areas in and around the Edmonton area to benefit wildlife and the public. To work towards this goal, they have secured well over 2,000 acres of land in and around Edmonton, which is then managed for its natural values for everyone to enjoy. This is EALT’s 10th Anniversary year. Photos of the opening available upon request.